Virginia wine is overpriced. I hear this refrain often during discussions with some of my local wine friends when asked why they don’t drink more Virginia wine. Like all wine regions, Virginia does have its share of crappy, overpriced wine, but I feel the ‘good’ Virginia wines provide an excellent value for the dollars spent. When I hear ‘Virginia wine is overpriced’ I wonder if people are really referring to the value a particular wine provides, or, are they really saying the wine is overpriced solely because it’s from Virginia. I have a wine friend who has held the opinion that ‘Virginia wine is overpriced‘ as long as I’ve known him. I believe he thinks Virginia wine is overpriced just because it’s Virginia wine (sound familiar). To test him – and to prove a point – I setup a mini-blind tasting (3 flights, 3 wines per flight) and my friend selected a Virginia wine as his favorite in two of the three mini-flights as I suspected he would. 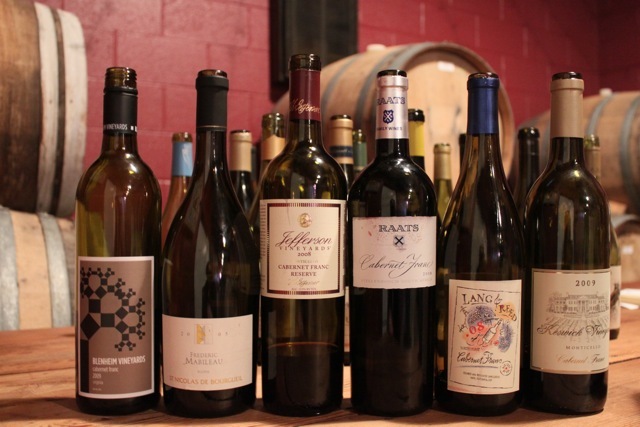 I concede that this mini-blind tasting was far from scientific, but it did prove a point – when compared to similar priced wines from more notable regions; Virginia wines match up very well. The topic of the price of Virginia wine came up during a recent conversation with Andy Regan, winemaker at Jefferson Vineyards that began as a result of a comment by someone on Twitter during a live tasting. We both lamented about these Virginia wine is overpriced comments, and talked about a comparative tasting at some point. The day after our conversation I received an email from Andy about the tasting – a blind comparative tasting with similar priced wines from across the world and Virginia. In his initial email, Andy noted that the intent of the tasting would not be about determining the ‘best’ wine in each flight (which would be impossible to do), but more about providing an opportunity to evaluate Virginia wine relative to comparably priced wines from around the world. As a passionate wine enthusiast and huge advocate of the value and quality of Virginia wine, I jumped at the chance to participate in such a tasting. In addition to other bloggers including my friends from Swirl, Sip, Snark, Andy had an excellent group of tasters for the event: Bruce Zoecklein, Virginia state enologist and enology Professor at Virginia Tech; Jim Raper, wine writer for The Virginia-Pilot newspaper; Stephanie Williams from flavor Magazine; Stephen Barnard, winemaker at Keswick Vineyards; Kat, also from Keswick; Kath Younger from Kath Eats blog, as well as several other wine enthusiasts. The tasting included 14 tasters/scorers evaluating each wine on seven criteria – aroma, fruit, acidity, tannin, mouthfeel, finish, and overall complexity along with our opinion on whether or not the wines were priced reasonably based on the quality. Each taster was also asked to identify the region/country of each wine. For me, the Virginia and French wines were easy to identify, but I had a more difficult time identifying the wines from California, South Africa and Argentina. Tasting setup at Jefferson Vineyards barrel room. Though I am not a fan of Pinot Gris (moonlights as Pinot Grigio in Italy), and typically only drink it by accident or when included in formal tastings such as this one, I gave this flight my all, but couldn’t muster true interest. All of these wines would definitely be at the very high end of what I would be willing to pay for Pinot Gris/Pinot Grigio. Thankfully there were only five entries in this flight. Finishing at the top of my tasting sheet – the Jefferson 2009 Pinot Gris. The overall group of 14 tasters scored this flight as follows: 1. Jefferson, 2. Pollak, 3. Eola Hills, 4. Charles Schleret 5. Adelsheim. The Eola Hills Pinot Gris is the only wine in this flight outside the price range, with a retail price of $13.99. As I’ve noted here many times, Viognier could be the future of Virginia white wine (if you happen to disagree, it’s ok, you’ve probably been wrong about other things as well 🙂 ). Given the quality of Virginia Viognier, this was the most anticipated flight of the tasting for me, and Virginia did not disappoint. The Jefferson Viognier Reserve and Blenheim Viognier finished at the top of my score sheet with a slight edge going to the Jefferson. Though the price range for this flight was roughly $18 to $30, Andy did include a lower and higher priced offering as well. Interestingly the most expensive Viognier in the flight – the $75 Francois Villard from Condrieu – finished at the bottom on my score sheet, and didn’t fare too much better in overall group scoring. Though I don’t want to Monday morning quarterback, I would have liked more vintage consistency in this flight, and perhaps another round of eight Viogniers with more regions represented. I have no doubt Virginia Viognier would still have finished atop a flight of 16 Viogniers as well. One could argue that some Virginia Viognier may be underpriced relative to Condrieu and California in terms of price-to-quality. I often wonder why people pay the $50 – $75 price tag for Condrieu for such little quality relative to the price (amazing what a French name on the label will do for rationalizing high price of wine). The overall group ranked this flight as follows: 1. Jefferson Reserve, 2. Keswick, 3. Porter Creek, 4. Blenheim, 5. Francois Villard Condrieu, 6. Yalumba, 7. Terra Blanca, 8. Ch. Camplazens Vin de Pays d’Oc. Each of the three Virginia Viogniers in this flight were stellar, no surprise they took three of the top four spots. After three white flights, we moved on to the much-anticipated reds beginning with Cabernet Franc, followed by Merlot, and finishing with red blends. Like Viognier, Cab Franc thrives here in Virginia so I fully expected the home team to sweep this flight. When the bottles were revealed, I was surprised by the origins of my top scorer – the RAATS 2008 Cab Franc from South Africa. In looking through my tasting notes from the last two years and plumbing my memory, I believe this is the first time I’ve had a Cabernet Franc from South Africa, and certainly will not be my last. Finishing second in my ranking was Keswick followed by the Jefferson Reserve. For our next tasting, this flight should be expanded to include more regions like Chinon and Long Island. No doubt Virginia Cab Francs would finish at or near the top of an expanded flight. The overall group ranked this flight as follows: 1. RAATS, 2. Keswick, 3. Jefferson, 4. Frederic Mabileau, 5. Blenheim, 6. Lang and Reed. Considering how the Sideways Effect has impacted Merlot prices in many regions, I worried if Virginia would be able to compete with equally priced Merlots from other regions. Once again Virginia wines showed well when tasted alongside similar priced wines from around the world. The Sbragio Merlot from Dry Creek Valley was my top scoring merlot followed by the Keswick Merlot. The overall group ranked this flight as follows: 1. Di Lenardo, 2. Keswick, 3. Thelema, 4. Jefferson Reserve, 5. Sbragia, 6. Mauvais Garcon, 7.Blenheim, 8. Te Awa. Sniffing - Merlot flight. Jim Raper of The Virginian-Pilot to my left. Bordeaux type blends are yet another area Virginia is excelling and turning out great wines at reasonable price points. The only exception to the $24 – $34 price range was the Don Tiburcio at $13, which finished as my top rated wine of the flight. I liked the character of this wine – eucalyptus and dark fruits along with light vegetal components throughout. Excellent QPR at only $13/bottle. Tied for second were the Keswick Heritage and Jefferson Meritage. The overall group ranked this flight as follows: 1. Keswick Heritage, 2. Chappellet, 3. Jefferson Meritage, 4. Bodegas Benegas Don Tiburcio, 5. Mulderbosch, 6. Cambon La Pelouse. * In the spirit of full disclosure I should note that I was able to pick out the Virginia wines – from familiarity of the aroma/flavor profile, or, perhaps a good random guess – in each of the blind flights, with only one exception. It’s possible, but not likely, that my familiarity of these wines subconsciously weighted my scores in Virginia’s favor. 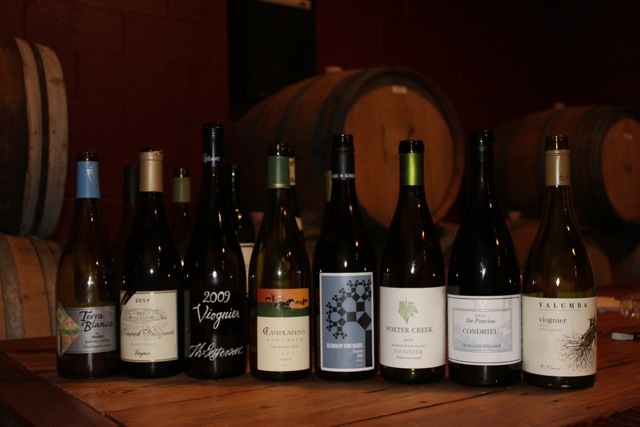 Once the wines were unbagged and the scores were tallied – Virginia wine was the clear winner (not that this tasting was about winners or losers)! Virginia wine finished atop three flights on my score sheet, and near the top in every flight. In overall scoring, a Virginia wine finished atop four of the six flights. Not only did a Virginia wine receive the most votes in four of the six flights, Virginia wines also consistently finished in 2nd or 3rd place in most flights. I realize this one tasting does not prove that Virginia wine is reasonably priced or overpriced or whatever. There is no way to definitively conclude that Virginia wine is overpriced, or not, because we all have different economic circumstances that determine our wine budgets; we have different preferences, and of course different definitions of value. What I hope this tasting proves to those who feel ‘Virginia wine is overpriced’ is that Virginia wine can go head-to-head with similar priced wines from more notable regions. Having taken part in many blind tastings, this was one of the best I’ve participated in – a big THANK YOU to Andy for organizing and hosting an amazing event! I appreciate being included in the tasting with such a great group of wine enthusiasts. Photo Credit: All photos courtesy of Kat Schornberg Barnard – thanks Kat! A big ol thanks to Andy for bringing out the great Riedel Th:Jefferson inscribed stemware for the tasting. Nice! Great write up! And a very relevant topic here in VA. We all hear this comment throughout the state and many of us do feel it partly comes from those that refuse to recognize the quality of wines that are now coming out of VA. One additional note to the higher prices in VA could be that it is more expensive to produce a wine in VA since we are not blessed with the most cooperative of climates/terroir. The blind tasting however proves that we do have many wines whose quality still compares well with those from other wine regions. Kudos to Andy for putting them to the test, and for everyone’s honest evaluations. It would be nice to see an article such as yours published in the trade magazines and papers for the rest of the world to contemplate! Hi Marty – Thanks for stopping by to comment. I hope you and your family had a great Thanksgiving! You raise a great point about the operational costs of producing wine here in Virginia. If more people knew the costs associated with producing wine here, they would certainly view the price on the bottle differently. All the best! Great article! I would have liked to have seen more WA and OR wines in the mix, but otherwise, I thought your array of selections was pretty diverse. Having never tasted VA wines, it will be interesting to see how they stack up to our local wines. It appears that your price points are similar to many of our local wines. We are also compared price-wise with Australian, New Zealand, Argentinean, and Chilean wines. However, I don’t mind paying a little extra to support our local wine industry! I’m pretty sure your local knowledge and being able to pick out the VA wines probably biased your personal scoring. We all develop our own likes, dislikes, and preferences based on what we taste the most often. I, for one, am not very fond of the French wines I have tasted, primarily because of the style of their winemaking. Looking forward to test-driving a few VA wines in the near future! Cheers! Hello Scott – thanks for stopping by to comment this morning. I am a huge fan of OR and WA wines as well, especially the Oregon Pinot. Like you, I too am willing to pay a small premium to support my local wine industry (as long as the quality is there of course). I hope you can join us on December 9th for the Discover DC’s Wine Country TasteLive! 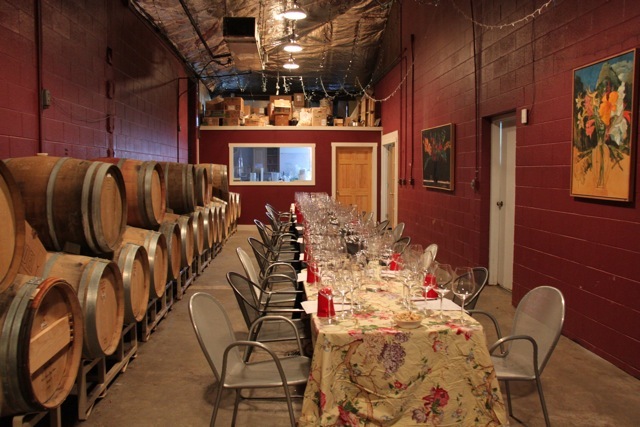 event to taste a few Virginia wines. Cheers! Frank, how great was this tasting? VA Wine Diva has a post on this coming, but it’s still in the works so I’ll chime in on yours (great, detailed post btw). Andy did a great job of putting this together. My only quibble – and I have NO idea how to fix this – is that I wish we could have dragged along a few of the “oh VA wine is too expensive” naysayers and rocked their world. Because they would have been impressed with how Virginia’s wines stacked up against the competition. Just a thought – I was taught that when someone says your product is priced too high, the right answer is “compared to what?” It’s an easy, non-confrontational way of making sure that folks are comparing apples to apples. This tasting was a good way of doing that. Thanks for bringing the cider doughnuts! Excellent summary of an interesting tasting. This was a great tasting – well it looks and sounds like it was. 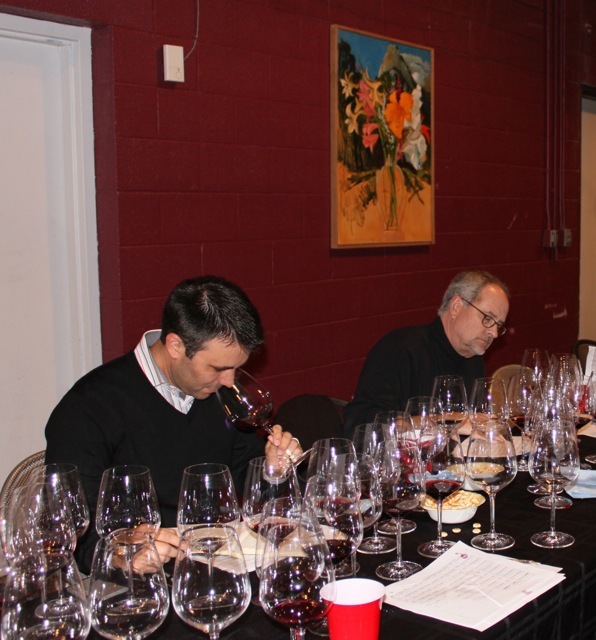 Blind tastings are amazing and can be real eye openers…wish I could have been there for this one. It’s funny you put this post up because just the other day I had a customer looking to buy 4 wines as gifts and wanted them to be from Virginia. Cool I said….then she says i don’t want to spend more than $10-$12 a bottle. YIKES – I told her that was a bit hard but lets see what we can do. (i didn’t say yikes out loud) Luckily I had recently brought in a bunch of wines from Lovingston and their pricepoints @ my shop were all in the 12-14 dollars and she was willing to go up a bit. But honestly if I hadn’t had those wines I and she would’ve been out of luck and we would have to shopping in another region. Then the discussion ensues about why VA Wines are so much more pricey than their counterparts around the world. From the retailers perspective it is hard to sell va wines in this economy that are around the $20 price which a lot of them are. (Especially the good ones, not counting Hortons fruit wines that are $11 haha) Where I can afford to do it, I don’t take a full margin on some va wines so I can keep the price down a bit – or closer to what the price is in the tasting room. Wow – just realized I rambled on quite a bit, haha. Next time you get one of these together – I’d love to take part…and could provide some samples. Frank – A great write up. Also what a great tasting! I love these kind of tastings and I get asked this question by media who call our office quite a bit. I find many VA wines to be a great value for the price although I too am biased. I drink a ridiculous amount of wines from VA. I loved the response from one guy when I was pouring a great VA Cab Franc wine that was priced at around $19. He said it was awesome but too expensive. When I asked what he Would spend $19 on, his reponse was “nothing.” That said a lot to me to remember where people are coming from. Still I want to tackle other nay sayers that say the wines are too expensive and routinely pay more for other wines that are comparable. BTW: I noticed that at the tasting two wineries dominantly represented VA. Please don’t forget about the area West and North of Cville. I think the Veritas Viognier, for example, might have competed admirably in that flight. 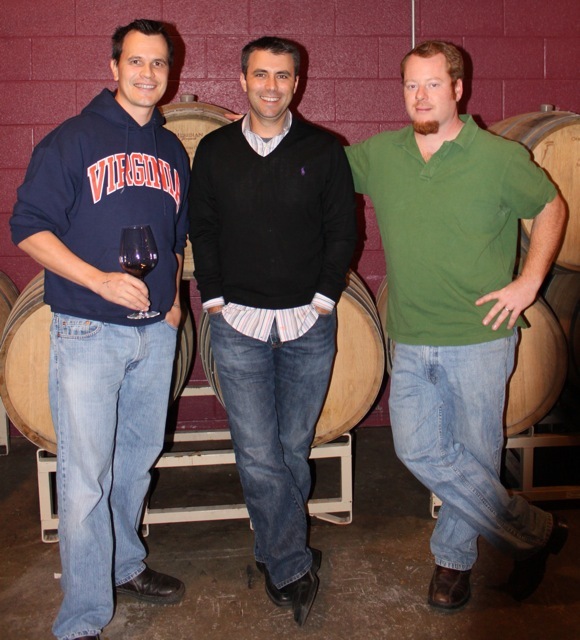 Thanks for a good defense of VA winemaking’s claim to excellence! Hello Alex: Thank you for stopping by to comment. Overcoming the ‘Virginia wine is overpriced’ misperception will take some time of course. With each international competition medal win, the exhaustive work of the Governor and First Lady of Virginia (and Sec. of Agriculture & Forestry), coupled with the quality wine our winemakers are producing, Virginia will certainly (eventually) get the due respect. As I’ve noted here many times, I personally feel Viognier is the future of white wines in Virginia. Interesting you point out the WSJ article as I am preparing a detailed Viognier post, and will address Jay’s WSJ article in the post as well. Totally agreed about those areas West and North of C’ville – some of my favorite Viogniers are made outside of C’ville: Veritas (wow), Gadino, Annefield, and a few others. This article is proof that Virginia can stand toe-to-toe with the rest of the world. Jefferson and Keswick are excellent producers. I would also recommend King Family in Crozet. They have an excellent merlot and viognier. Hello Bill – thanks much for stopping by to comment. You are indeed correct, Virginia wine can stand toe-to-toe with other regions, especially when compared with wines of similar price points. I’ve visited King Family many times and have big time respect for Matthieu’s wines (especially that Viognier). Are you a C’ville local? What are you favorites in the area? 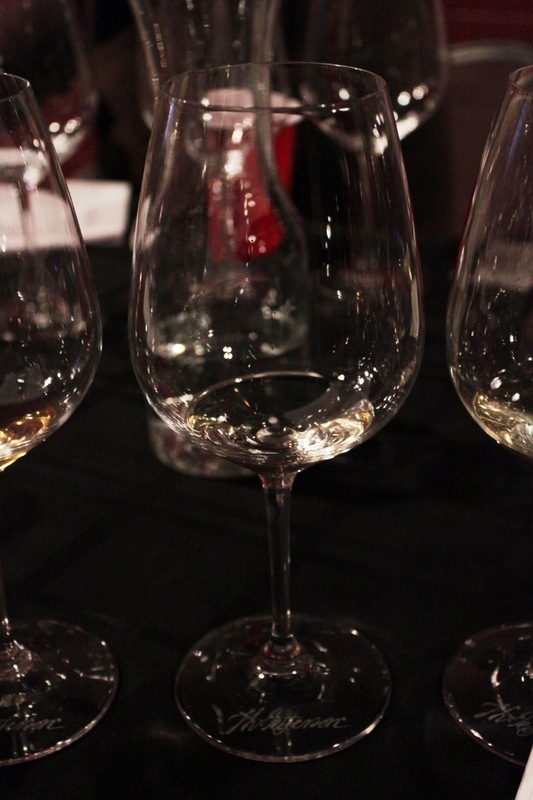 The wine can certainly stand toe to toe with other wines from a quality standpoint. However, I can get better wines for cheaper from other regions. This, Virginia wines are too expensive. Full stop.